He is discovered in a Mexican pyramid in 1938. He is then awakened and studied by a Nazi vampire study team in an underground base. The team, led by Major Stroheim, conducts live human experiments with the stone mask to try to strengthen the Nazi Army. The team awakens Santana in an advanced isolation room fortified with steel plates, and conduct behavioral experiments on him. They soon find that Santana feeds on vampires and is able to absorb food from the surface of his body. The team then is shocked by Santana's escape from the isolation room. Santana breaks many of his own bones in order to squeeze himself into the 4-by-20 cm ventilation outlet of the room, and does all this at a speed faster than human eyes can perceive. The team shoots Santana with machine guns, only to find that Santana has learned their language and the mechanisms of their weapons from only minutes of contact. He then easily disposes of the Nazis who disturbed his sleep, and even manages to stay alive after being attacked, exposed to sunlight, and blown up. He is named after the long-lived rock group Santana. 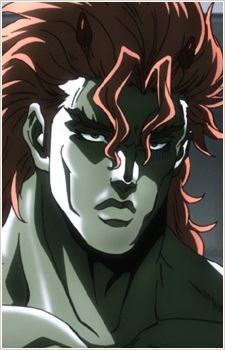 He is the only member of the Pillar Men to survive, and is theoretically still alive throughout all of the arcs. However, due to his vastly-improved Ripple power, it is possible that Joseph killed him after returning to America.